Maximus the Confessor: "God Divided the Ages Wisely"
He who brought the whole world into existence, visible and invisible, according to the sole urge of His will, beyond all the ages and the very creation of the created, He had ineffably the supreme goodness of the will towards His creatures. And this will was for Him to be united without change with the nature of men, through the true union of existence, and to unite with himself the human nature without change, so that himself would become a man, accordingly as He knows, and by the union with Him, He would make man God. Namely, He divided wisely the ages and He appointed a part of them to the work of Him becoming a man, and the other part to the work of making man God. 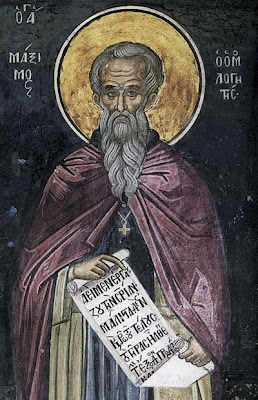 Of the ages that were appointed to the work of Him becoming a man, the end has come to us, when the divine intention was fulfilled by the very facts in the incarnation, which is exactly what the divine apostle studied; in the very incarnation of God and Word he saw the fulfillment of the divine intention for God to become a man, and he says that the end of ages has come to us (I Cor. 10.11), not meaning all the ages [ended] in us, but obviously the part of them which was appointed to the work of God becoming a man has had its proper end according to the intention of God. Since then the ages appointed to the work of God becoming man have received their end in us and God worked truly and completed his perfect incarnation, we should accept the ages to come for the work of the secret and ineffable deification of men, when God will reveal the superabundant wealth of his goodness upon us (Eph. 2:7), having worked perfectly to the worthy the deification. Because, if he himself has ended the secret work of the incarnation, in all manners except for sin having become like us and having descended even to the lowest parts of the earth, where the tyranny of sin had pushed and exiled man, it is certain that the mystical work of the deification of man will be completed too, in all manners whatever, except only for the identity of the essence with Him, as is obvious, and having made man alike him and having elevated man above all heavens, where by her nature the greatness of the grace, the infinity of goodness, invites man who lies below. Since the reason of acting is different from the reason of suffering, secretly and wisely at once the divine apostle divided in past and future ages the reasons of doing and suffering. That is, the ages of the flesh, where we now live (...) are proper to acting, while the future ages of the Spirit, after the present life, are proper to the alteration that suffering brings. Therefore, while we are here, we approach as people who act the end of ages, when our power and work will come to their end according to acting. But in the ages to come, suffering by grace the deifying alteration, we won't act but we will suffer and because of this our being worked by God won't come to an end. Because this passion will be above nature and it won't have any reason limiting the divine and deifying work, extending to the infinity upon those who suffer it. For we act while we have active the spiritual power which by nature generates the virtues, and the spiritual power of receiving all knowledge, which incomparably transcends all nature of whatever exists and is known and leaves behind her all the ages. And then we will suffer, after we will have passed completely the reasons of all created out of nothing beings and we will have arrived unknowingly to the cause of the creatures and we will pause together with all that is limited by nature our proper powers, becoming that, which is not at all an accomplishment of the natural power, since nature has not a power able to comprehend what is above nature. Because by nature nothing created can act the deification, since neither can it comprehend God. For only the divine grace properly has the nature to grant accordingly to the beings the deification, glorifying nature with the light that is above nature and bringing her above her proper limits according to the superabundance of glory. Therefore, it is not strange that the end of ages has come to us, who won't receive so far through grace in Christ the gift of the goods that transcend ages and nature, of which images and sketches have become the manners of virtues and the reasons of those able by nature to be known, through which God always wants to become a man in the worthy men. Therefore blessed is he, who in himself wisely made God man and completed the generation of such a mystery, and after that he suffered to become by grace God, because he won't have an end in becoming eternally this. Because He who works the deification in the worthy, is indefinite in His nature, He has indefinite and beyond all indefiniteness the power that works this and never ends together with those made by her, as it happens with us, but rather always by herself holds those who by her received being and are not able to exist without her. Whence he spoke about a wealth of goodness, since the divine and all-shining disposition towards us in goodness, according to the alteration which regards our becoming Gods, never stops. Source: From Questions - To Thalassius, Q. 22. Translated by Elpenor.